Flores has 6 airports with flights to Sumba, Timor and Bali and within Flores itself. Labuan Bajo has the most funky terminal while Larantuka has the cutest one. All airports, except Bajawa are within a few kilometres from the towncentre. Getting transport into town is easy with always cars and ojek at the terminal waiting for passengers. Since march 2015 prices for flights are including airporttax. Keep in mind that carriers, routes and schedules often change. Therefore bookings best can me made no longer than 2 months in advance (holidays/Idul Fitri/Christmas/New Year) and 1 month before the travelling date outside these periods. 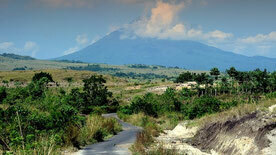 The Trans Flores Road runs from east to west, from Larantuka to Labuan Bajo and is around 660 kilometers. In May 2016 for the first time Flores was blessed with the Tour de Flores for which the mainroad was prepared to be in super condition like never before. But, this was in May 2016 :-) Only one landslide and you will definitely come across some potholes causing delays. Many roads, off the Trans Flores Road are still in bad condition so when travelling more off the beaten track you will find yourself in a real adventure best to handle with a motorcycle of fwd-car. Check also stories (Hit the road Jack). The Trans Flores Road running from Larantuka to Labuan Bajo was in good condition in May 2016; however in the meantime some parts are affected again from the continuous landslides earlier this year and there are many projects including the renewal of several bridges. Travel by road on Flores is slow, the average speed on the main road is around 35 km/hour as the road bends all the way (660 kilometers of asfalt is needed for the actual 375). I have checked some stretches via Google Maps myself. Some of them are close to reality, but in particular the roads inland or off the Trans Flores can hardly be calculated with Googlemaps. Some examples: travel times claimed by Google Maps to Denge (for Wae Rebo) or the northern route from Riung to Reo are not realistic. You can easily multiply them due to the condition of these roads. The good news is that except a few kilometers around the small towns there is hardly any traffic. However, sometimes you have to be patient when a loaded truck crawls up the mountain road and it can take some time before it is safe enough to pass the vehicle. Junction to Todo-Wae Rebo. Except a strech of 500 meters the road to Todo is ok. Todo to Dintor is a disaster. Almost every road leading to a waterfall takes a long time as many of them are in the rainforest. Long distance buses run between the towns of Larantuka, Maumere, Ende, Mbay, Riung, Bajawa, Reo, Ruteng and Labuan Bajo, starting early in the morning. No fixed schedules. Buses are small and simple and you will travel together with the locals and everything they carry (including chickens, freezers, huge baskets with eggs… well fill in yourself). If you are (un)lucky (part of the adventure?) a tire has to be changed on route. There are no big airconditioned touringcars on Flores. Outside the main route you can travel to more (remote) destinations but schedules of bemo/angkot are unreliable while other bad roads only can be handled by public trucks. Both bemo/angkot or trucks are very few. To reach these aereas it is best to hire a fwd but as there are few fwd's on Flores a motorcycle is an alternative. Within town run minibuses (bemo or angkot) which is always the cheapest way in town. Count on Rp 3000 within town. Don’t even think about driving yourself in Indonesia! Although roads are almost empty, many western people are not used to drive on the left side and if in case there is an accident you will regret for the rest of your life you ever intended to drive yourself. Hiring a car with driver is about the same price as hiring the same car without one. As a passenger you don’ t have to take care of the traffic but only enjoy the beauty of Flores and therefore more relaxed. Arriving at the airport you can easily get a car with driver. You don’t need to look for them, they will find yóu. Rates depend on distance an how many days you want to hire the car. Count on anything between Rp 700.000 and Rp 900.000 for one day. Negotiable of course. Booking in advance is possible too. You can contact me to find you a reliable driver with a decent car. Many tourists come from Bali to Flores and will be disappointed by the high(er) prices for hiring a car with driver. So, maybe some explanation is needed. Many of the cars on Flores are from Bali or Surabaya and Jakarta (Jawa). This means extra costs of transportation, plus costs for converting the license plate or if not, every year a trip to pay for the cartax at the spot (thus Bali or Jawa). Maintenance and replacing spare parts is more expensive as well as there is no decent stock. 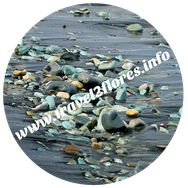 On top of that the tourisme on Flores is not yet a fulltime business like on Bali for example. And, at last, the standard of living on Flores (and other islands of NTT) is higher. For hiring a car with driver (and/or guide) there are many possibilities. 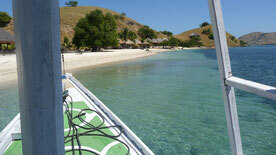 Most people start in Maumere and travel overland to Labuan Bajo. Sometimes in 3 days (yes, there are) and sometimes in 2 weeks and anything in between. Drivers can take you from place to place but sometimes they also can guide you with (sometimes) extra costs. Also drivers have various systems. Sometimes you are asked for a minimum 3 to 5 days carhire, sometimes you are charged for an empty leg (at the end the driver needs to go back), some prices are low end, some are high end, sometimes the guiding is included, sometimes it is not and sometimes you will be extra charged for routes via bad roads like to Wae Rebo or other roads furthe away from the main road. In general with an overland trip with a minimum of 5 days count on a minimum price with an average of Rp 800.000 per day. This includes car, driver, petrol, costs for driver (accomodation/meals). It doesn't work to hire a car for 2 or 3 days from A to B and for example again after a few days. You will lose a lot of money as an additional charge and/or emptyleg will be charged. It depends on business logic, common sense and your nego skills to get a fair price. There is no such a thing as fixed price in Indonesia. Good luck. If you need help I will be here. Sometimes a motorcycle (ojek) is (more) convenient (than a car or angkot). Count on Rp 3000 - Rp 20.000 depending on distance and your negotiationskills. In Labuan Bajo they often try to rip off tourists. You can also rent a motorcycle in many places, especially the touristplaces like Moni, Bajawa or Labuan Bajo. Prices should be between Rp 60.000 to Rp 100.000 for a day (excluding petrol). When I checked in Labuan Bajo in January 2019, they all seem to have the same price of Rp 75.000. In other towns you sometimes can rent just from the ojekdriver or a “friend” you meet on the street. Hiring a motorbike for overland Labuan Bajo to Maumere is still not the standard so you have to shop around first. If you do so, be keen on the extra charge for sending the motorbike back to Labuan Bajo. Up to Rp 200.000 is reasonable to my opinion. However, I do not recommend to go by motorbike overland. First of all it is quiet a distance, maybe not in kilometers but in time. Second, the Trans Flores is winding almost all of the time with sometimes steep bends and third when it rains it is too dangerous to travel by motorbike. And, it can rain often and a lot on Flores, the biggest part of the journey is through the mountains. Renting a motorcycle is ok for short distances unless you are an experienced driver. One of the tricky problems can be the sudden rainfall when the asphalt becomes slippery and the road is one bend after another. It is more wise to do the long hauls by bus, car of travel (shared taxi) and you can hire a motorbike for shorter distances around town like in Labuan Bajo, Bajawa and Moni. In Ende and Ruteng there is no real touristscene where yo9u can rent a motorbike, so ask an ojekdriver there. 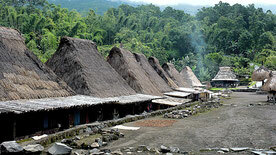 Gunung Mas is a well known travelcompany on Flores. Tel +62 813 39380830 , +62 813 39150257 (mobiles). There are no metered taxi’s on Flores. You can take a car from the airport, ferrylanding or busterminal and sometimes from hotels but rates are much higher than the “real” taxi’s you find on Java of Bali for example. Airport "taxi's" in Bajawa, Ende, Labuan Bajo, Larantuka and Maumere will charge around Rp 60.000 per person. There are boats in shapes and sizes on Flores. ASDP are small ferries which connects Flores with Sumbawa, Lembata, Sumba and Timor.Wooden boats sail between Larantuka and Solor, Adonara and Lembata. Although the button for English does not seem to work, it is not too difficult to check the schedules. Keep in mind that routes and schedules often change and crossing times depend also on weatherconditions. You also can rent a boat (speed or perahu motor). When heading for Komodo NP and you want to visit islands as far as Rinca/Padar/Komodo always look for a boat with at least two engines. Also check the boat on safetyfacilities and that you can communicate with your captain (English, if you don’t speak Indonesian). Boatrental is vague on Flores with sometimes “fantasy”prices. Prices have increased the last 5 years, especially in Labuan Bajo. If you are in doubt you also can book on a seat-in tour together with other tourists. A private boat for about 10 passengers depending on distance, destination (the seas between Labuan Bajo and Komodo can be very rough from time to time, see also stories) and extra’s (meals, water etc) will cost anything between Rp 600.000 and Rp 3.000.000. Shop around before you agree and also check the weather forecast for the day of your trip. Therefore it is best to book one day before. For guests who want to explore Flores with public transport and/or want to go to some particular areas, want to climb a mountain or want a trekking it is wise to hire a guide. Al local guide can help you to find your way (climbing, trekking, for example climbing volcanos, trekking to remote villages) and/or is able to understand local tradition and can speak the local language. Depending on their skills (climbing, local tradition and language, English) fees for guides range from Rp 100.000 to Rp 550.000. Note that some drivers also add a fee for guiding but keep in mind that this is not always nescessary depending on the route, where you want to stop, what to see. There is a huge difference in guiding. A guide who take you to the top of the Inerie is not the same as a guide who takes you to Koka Beach for example. See also "Car with driver and How to..." here above. When you need a guide, also when only 1 or 2 days during your trip I can help you with that as well.